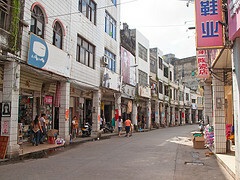 Wenchang is a county-level city in NE Hainan province, China. It was promoted from a county to a city on November 7, 1995 and has a population of 86,551 in 1999 (estimated 2006: 115,000). Wenchang is the source from where most overseas Hainanese migrated. Majority of Singapore’s Hainanese population has ancestral roots in Wenchang. Wenchang Hainanese is considered to be the prestige dialect of Hainanese and is used in the local news. Wikipedia : Wikipedia information about Wenchang.